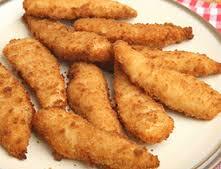 Ask your fish monger to prepare some fish for goujons. He will know what is best on the day. Gently dip a piece of fish into the flour. Shake off any excess flour then place into the egg mixture and turn them until evenly coated. Put a large frying pan on a medium heat. Add a splash of oil then fry the fish goujons for 2 to 3 minutes on each side, or until golden brown and cooked through.